There is now a lovely Facebook group that content creators and readers can join. The group is public, so even those who are not members or not yet open about their condition on social media can still access everything that is shared. * If you are interested in a private support group where your Facebook friends and family will not be able to see your posts, check out this group. Members can post directly to the group's page. We'd like to create a positive and safe place to share anything you find useful or relevant as well as anything fun, uplifting or encouraging. This could include anything from the latest research articles and advocacy events, relevant blog posts, pictures of your service animals, things you've created or a personal struggle or victory. The aim is to keep it kind, supportive and relevant to people with ME. A sort of social media directory. For those who prefer not to use Facebook regularly, you could drop a link to your preferred social media profile in one of our dedicated threads so that others on that platform can find you. You could also share links to your favourite ME and CFS profiles - patients whose pages you enjoy following. The aim is to create a list of pwME to follow and interact with on your preferred social media. So Who Is This Community For? Anybody with ME or CFS or any carers of people with ME or CFS can join the ME/CFS Community. The groups are not just limited to people who blog, but also YouTubers, Instagrammers and Facebookers with ME or CFS. Patients and carers alike. Even people who prefer hanging out on Twitter or Pinterest could leave their profile links in the group as mentioned above. What If I Don't Have Content To Share? If you are a patient or carer, you are welcome to join! There will be lots of relevant content for you to access and we would love to have you join us. I know that some people with ME cannot type and prefer audio clips. Many cannot manage more than one social media platform at a time either and prefer to stick to something simpler like IG or Twitter. Others just like to follow along without interacting. All are welcome. This is why the group is public, so that people can access the information available to them without necessarily joining in. I'd like to have relevant content, from wherever, shared to this group so that people with ME, once diagnosed and searching for information, can find people who understand them - a collection of resources by people who know what they are going through. Lets help the ME community to unite and support each other. I believe we are stronger together and I'd hate for newly diagnosed people to feel lost and alone when there are so many of us out there trying to help them by sharing our experience. I have also created a community on Google+ where ME/CFS patients and their carers can share or find relevant content. I regularly share community posts in there myself. Click here to join! Finally, there is a Pinterest group board for ME and CFS bloggers! Feel free to pin your posts directly onto this board. To be added as a contributor, follow me on Pinterest and send me a message asking to be added. You can also leave your Pinterest link or username below in the comments and I'll add you. You can find me on Pinterest at Chronically Hopeful and the ME Bloggers group board is here if you'd like to follow just that board. We ​also have a Tailwind Tribe you can join if you're using Tailwind to automate your pinning schedule and promote your blog​. We can help each other grow with this great tool that makes the whole process easier and saves us time. Join the ME & CFS Bloggers Tribe on Tailwind. Exciting Times For People With ME! I am so excited about this new platform to share experiences and support each other on this slow and patient journey to recovery. With all the buzz in the media lately and various research projects happening, it would be great to have more people pooling their content in an easy-to-find place! I had a hard time finding ME specific content created by people with ME and I think having them all in one place would be very helpful to patients, specially those who are suffering with cognitive issues that make navigating the internet that much harder. Also, by sharing our experiences we can show newly diagnosed people that this doesn't have to be a life sentence. There are still ways we can contribute and experience a good life within out limits. I'd like this to be a place where we not only educate, but give support and hope. 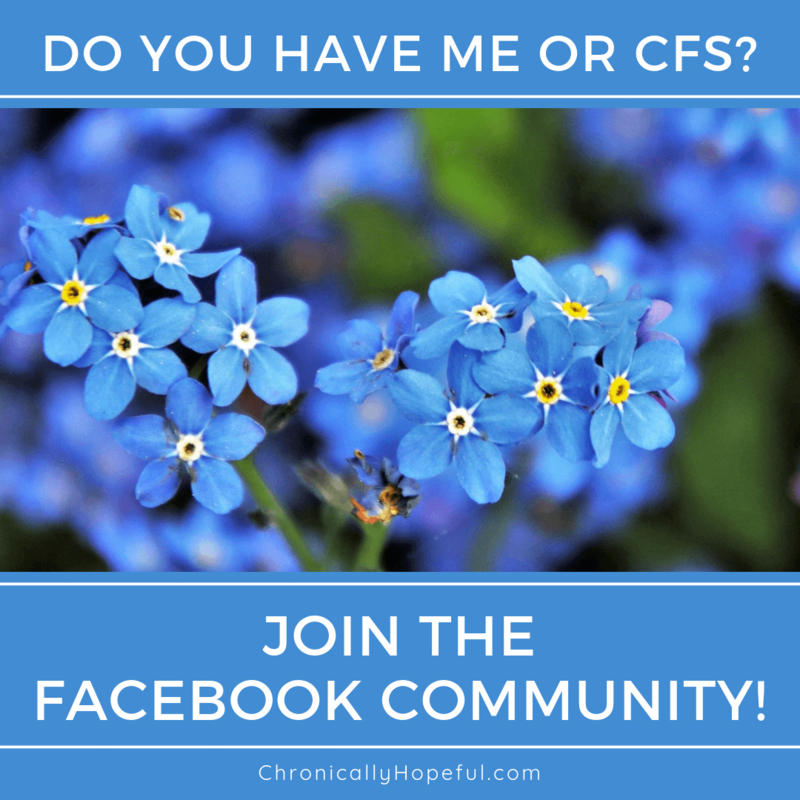 Come join the ME/CFS Community! I’m a fellow keto ME/CFSer and just found your lovely invitation and great idea on chronic illness bloggers. It’s good to meet you! I’m following you on Pinterest (I’m “chrillog”), have sent you a message on FB ? and bookmarked your Google page. I’m a former family doctor with me/cfs x 20 years now and improving. I blog mostly about the science and research linking subtle and overt types of adverse life events with risk for chronic illness of all kinds, including but not limited to me/cfs. It’s so hard to do a lot of research when we have a disease for which no diagnostic tests yet exist, although many good things are arising. As a result, I write about research in many other diseases such as type 1 diabetes (the autoimmune form of diabetes) to show the science, which is similar for many diseases, including my version of me/cfs. Research is explaining the interaction between life events, our developing nervous and immune systems and other organs, and how they change the way our genes function to influence our health. It’s not psychological, which is helpful to know! That’s my focus, along with sharing the new tools this info gives us. If you’re not familiar with Cort Johnson of the ME/CFS blog called Health Rising, it provides a lot on all the latest studies, has a very engaged community and is a great one to subscribe to. It’s lovely to meet a new colleague and fellow journeyer! Hi Veronique, I am so glad to have you on board! Thank you for sharing your experience and knowledge – I think it is so important for us to speak up and stand together to raise awareness and support each other.